You will always feel welcome at Dr. Michael Tobey Chiropractic! I grew up in the Willamette Valley of western Oregon, I met a girl and we got married. She had four kids and we had a fifth on the way when we sold everything and moved to Bend in 1991. My parents thought we were crazy for leaving an established chiropractic practice and starting over. But we did it. And the timing was beautiful, because Bend was really starting to grow. We treat people how we would like to be treated. While my practice hours are 9 to 5:30, I typically get to the office at 8 o’clock. And if somebody drives up at 8 o’clock, they don’t have to wait until we officially open. I want to help them right then and there. We offer same-day appointments. Nobody knows when he or she is going to wake up some morning with a stiff neck! And if they do, they want to see someone now, not next week. We’ve built our practice on being super convenient and accessible. This chiropractor in Bend is here to serve. We always keep time open for new patients. I’ll stay late or I’ll see them on my lunch hour. I know what it’s like to suffer. So we bend over backwards to help people who want relief. And while everyone talks about wellness, after more than two decades of chiropractic practice, mostly in Bend, Oregon, I’ve learned how to help people in pain. We’re not one of those practices that force you to come three times a week for months and months. I tell new patients when they come in that they’re going to feel better in two or three adjustments or two to three weeks. And if they’re not, I’m referring them out to someone who can. Put Us Out of Business! My dream is that everyone does what we recommend and they become so healthy that I put myself out of work so I can golf all the time! Seriously, we love helping families get well and stay well. We’d be honored to be your chiropractor. 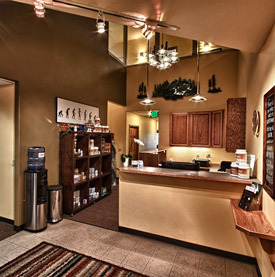 Give our Bend chiropractic office a call to get started with care today!